This X-shaped contemporary bar and stool set is the perfect way to spice up your entertainment or living room. The striking bar unit features glossy acrylic panels accented with chrome. Built into the bar are storage places for wine bottles and glasses. Behind the bar is concealed storage shelves. 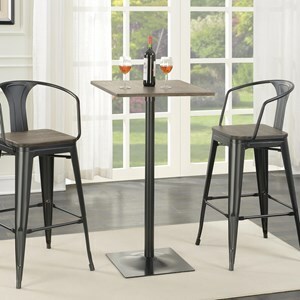 The Bar Units and Bar Tables Contemporary X-Shaped Bar and Stool Set by Coaster at Value City Furniture in the New Jersey, NJ, Staten Island, Hoboken area. Product availability may vary. Contact us for the most current availability on this product. 190129 Contemporary Round Stool 2 0" 0" 30.25"
130078 Bar Unit 1 47.25" 19.75" 42.5"